The paperwork, proxy forms, previous minutes, agenda etc. are available. The Chairman's and Treasurer's reports from the AGM are now available. Details for the Scale7 Mark Meeting in October 2014. The May 2014 newsletter is now available for members to download. Important information about the Brightwell Show. The November 2013 newsletter is now available for members to download. Congratulations to Ian Middleditch for yet another first prize for his superb model of LMS Mogul. Full details of the Mark S7 meeting on 12th. October are now available. 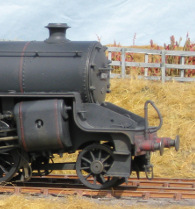 Ian Middleditch won first prize at Guildex in September, with his G&SWR 0-6-0 No 168. Vic Burles also took a prize for his superb Bulleid West Country 34002 Salisbury.